In Her Messages, the Most Holy Mary always tells us about the importance of praying the Mysteries of the Rosary so that we can be closer to the Most Pure Heart of the Divine Mother and to fulfill this request we can try to understand such Mysteries better through a study. This journey of prayers leads us to contemplate Jesus’ Life in His Passage through the planet with the merciful task to save and redeem us. Why are they called Mysteries of Contemplation? The word “mystery” means, in Greek, a secret thing, something that keeps a secret, and is related to the action of being in silence. Then, we understand that we must silence our minds and emotions to open the heart and stand before Jesus’ Life to contemplate! For this reason, they are called Mysteries of Contemplation. “Dear children, I ask you to pray with the heart and to live each one of the Mysteries that My Son lived out of  Love for you”. So, let us, with the Mysteries of Contemplation, walk towards the Divine Heart of Christ! How did these Prayers emerge? In the year 900, the monasteries used to sing and pray the 150 psalms in Latin. For those who had not studied and did not know Latin, it was recommended the repetition of 150 prayers of the Our Father. This form of praying became known as the lay person's prayer. Over time, some people who were devoted to the Virgin began to insert the Our Father between the Hail Maries, repeating the Annunciation of Archangel Gabriel (also for 150 times, as the Psalms). It is said that in the year 1200, Domingos Gusmão (a monk who was the founder of the Order of the Preachers, which later became the Dominican Order) implored the Virgin to intercede in a situation that the Church in Europe was living. He received the visit of Mary who requested them to pray 150 Hail Maries intercalated with the Our Father. Domingos Gusmão obeyed, received the Grace requested, and from then on, he made public with great devotion this form of prayer. In 1300, the 150 repetitions of the Hail Mary was divided into 15 decades intercalated by one Our Father. There are reports of many miracles, which strengthened the spread of this form of prayer. Moreover, during apparitions in various regions of the world, Mary always summons us to devotion and prayer with the Mysteries of Contemplation. The title of each Mystery reveals its essential energies, we contemplate: Joy, Light, Sorrow and Glory. In each one of these energies we contemplate five episodes of the life of Jesus. In each Passage of the Life of the Master we pray the Hail Mary ten times, and in between the decades we pray the Our Father. So, each Mystery totals fifty beads. 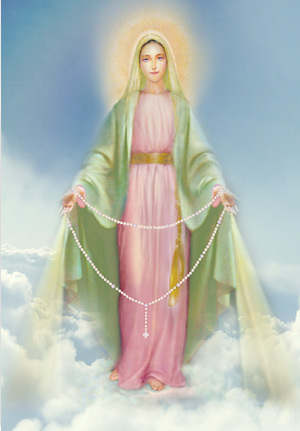 In the end, a full Rosary with the four Mysteries totals 200 beads. The idea here is not to create formulas, but to share experiences of the life of prayer. We have found that this way of praying places us before Christ, Mary and God, before the energy of the Trinity. And all this, in a renewed way, in a different level of consciousness. An example of this experience is the “rediscovery” of the Hail Mary prayer. In one of Her Messages, Our Lady asked for this prayer to be rescued because, over time, it came to be prayed in a repetitive way, automatically, without reflection. “Hail Mary, full of Grace, the Lord is with thee”,  was the phrase of the Archangel Gabriel as He greeted and announced to Mary Her condition of Divine Creature. “Blessed are thou amongst women”, was a phrase with which Elizabeth greeted Mary, recognizing Her Divine Task of Perfect Union with God. Yet, in the phrase: “And blessed is the fruit of thy womb”, Elizabeth also recognizes the Christic Presence in Mary’s womb. With “Jesus”, we discover that the prayer core is the word Jesus and we place ourselves before Him: the Path, the Truth and the Life. When we focus on each episode of the life of Jesus in a concentrated and attentive way, when we offer ourselves to remain before Him in inner silence, when we open ourselves to penetrate the Mysteries withheld within, a great possibility is unveiled: our interior is elevated, we place ourselves at the feet of Christ and Mary; we enter into a State of Prayer. It is not the case of simply bringing a scene to our imagination; it is a case of allowing the Life of the Spirit to speak inside of us. To announce a Mystery with total concentration is to open a portal that leads us to God. The Mysteries of Joy: the Joy of the manifestation of the new life! 1. Let us contemplate the Annunciation of the Archangel Gabriel to Mary about the coming of Christ: here we are before the virtues of faith, obedience and humility to receive a new Life and make the planet become sacred. 2. Let us contemplate the visit of Mary to Her cousin Elizabeth: here we are before the exercise of fraternity, the meeting of brothers and sisters who recognize each other and unite for the Divine Purpose. 3. Let us contemplate the Birth of Jesus: here we are before the Christ that may be reborn inside of us in the daily situations of life, in our inner manger, the Temple which shelters the Sacred Life. 4. Let us contemplate the presentation of the child Jesus in the Temple: here we are before the opportunity to present ourselves to God and to surrender to Him. 5. Let us contemplate the scene in which Jesus, still a child, was found in the Temple: here we are before the dedication and the unconditional choice for the Spiritual Life. The Mysteries of Light: the Life that manifests Light! 1. Let us contemplate the Baptism of Jesus: here we are before the offer that our vibrations are bathed by the Spirit of God. 2. Let us contemplate the Wedding at Cana, when Christ transformed water into wine: here, we are before the opportunity to recognize in ourselves the capacity to transform situations of life. 3. Let us contemplate Jesus announcing the Kingdom of God: here we are before the vows in order that our lives may express the spiritual virtues, following the Laws of God. 4. Let us contemplate the Transfiguration Jesus: here we are before the possibility of, one day, seeing our true face, our true Being. 5. Let us contemplate the Last Supper, when Christ gives us His body and blood, symbolized by the bread and by the wine: here we are before the Communion with Christ, living His Love, His Forgiveness, His Redemption. The Mysteries of Sorrow: the Love that purifies, forgives, redeems and saves! 1. Let us contemplate Jesus in the Garden of Olives: before an extreme distress, the possibility of maintaining absolute trust in the Father. 2. Let us contemplate the Flagellation of Jesus: before physical and moral sorrow, the possibility of sustaining ourselves in the dignity of being children of God. 3. Let us contemplate the Crowning of thorns: before humiliations, the possibility of living humility. 4. Let us contemplate Jesus carrying the Cross: before our own cross, to sustain it and transform it. 5. Let us contemplate the Crucifixion: with our own sacrifice, to unite to God, making a bridge between Heaven and Earth. 1. Let us contemplate the Resurrection of Jesus that brought us the consciousness of Eternal Life. 2. Let us contemplate the Ascension of Jesus that shows us the joy and the glory of the return to the True Dwelling. 3. Let us contemplate the coming of the Holy Spirit that opened to us the possibility to receive this Divine Flame. 4. Let us contemplate the Assumption of Mary that brought us the example and the consciousness of Her Immaculate Purity. 5. Let us contemplate the Crowning of Mary, recognizing and honoring Her as Our Queen, the Savior of souls. Before these Mysteries, we can contemplate the glorification of Jesus and Mary: They fulfilled the designs of the Father and entered into the Kingdom of God; He is sitting at Father’s right and She is waiting for the moment when all of Her children will enter the Kingdom to take their place. They are there to intercede for us until the end of time.